A National Historic Landmark, the Treviño-Uribe Rancho is an exceptional example of Spanish Colonial/Mexican Period architecture in the American Southwest, and one of the finest surviving examples of domestic borderlands architecture in the United States. Initially constructed ca. 1830 for Spanish/Mexican settler Jesús Treviño as a modest single-room rancho, the Treviño-Uribe Rancho expanded through four or five building campaigns over the following 40 years. The rancho is an excellent representation of borderland architecture and of the early ranching practices that came to define the built environment of Texas and much of the southwestern United States in the 19th century. The Treviño-Uribe Rancho is the direct result of early Spanish settlement attempts of the lower Rio Grande area. By the late 1600s, Spanish authorities determined that they needed to establish colonies in what is today northern Mexico and southern Texas to protect and secure Spain’s New World claims from other colonizing European countries. One way in which they sought to secure their land clams was to establish villas (towns) throughout the region. Following the formal organization of the new Spanish province of Nuevo Santander in 1746, Spanish colonizer José de Escandón planned and established villas and ranches along the south bank of the Rio Grande beginning in 1747. Escandón successfully attracted Spanish settlers by offering incentives, such as “good land,” no taxes for ten years, and generous allowances. Escandón’s colonizing efforts inspired other ranchers already living in the area to request permission to establish their own similar settlements. Together, under the jurisdiction of Escandón, colonizers established many successful settlements south of the Rio Grande. With the success of the southern ranchos, settlers looked to expand north of the Rio Grande. Dolores was the first successful Spanish settlement on the north bank of the Rio Grande in present day Texas; this was an important step in extending Spanish ranching and settlement patterns to the north side of the river. With the flourishing example of Dolores, other settlers began establishing ranches on the north side of the Rio Grande by the 1830s. Despite the threat of raids from Comanche and Apache American Indians, Mexican pioneer settlers and ranchers continued to cross the Rio Grande to both extend existing ranches and to establish new ones. Two Mexican settlers to cross-over to the northern side of the Rio Grande were Jesús Treviño, a wealthy alderman from the south bank settlement of Guerrero (formally named Revilla, which was one of the most successful settlements south of the Rio Grande), and a widow named Doña Ygnacia Gutiérrez Uribe. 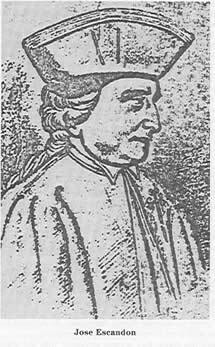 Jesús Treviño established the Treviño-Uribe Rancho, though it was Uribe’s son who became responsible for the final appearance of the rancho and for the development of San Ygnacio, Texas. Around 1830, Jesús Treviño purchased 125,000 acres of ranch land on the north side of the Rio Grande and began construction of a modest one-room rancho, identical to those that stood in Guerrero. This was likely just an outpost for him, as he maintained his primary residence in Guerrero. 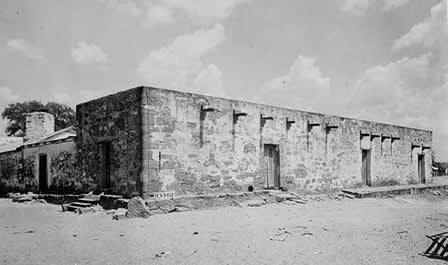 The original building with its high, thick sandstone walls, windowless facades, and troneras or gun ports and secured gate entry, all testify to the building’s dual purpose as a ranch and fortified shelter. In response to the region’s continuing “frontier” status, harsh environment, threatening American Indian tribes, isolated circumstances, and limited building materials, the area’s settlers developed specific architectural techniques that provided them with functionality and protection. The location of the ranch, sparse population, and no rail access limited opportunities for commercial agriculture, but livestock ranching was a common practice. Ranches raised stock, including herds of cattle, sheep, goats, swine, horses, mules, and burros, for food and trade. Longhorn cattle were most likely cared for at the Treviño-Uribe Rancho. Jesús Treviño continued the Spanish Colonial/early Mexican traditions of mounted herding, roping methods, round ups, and cattle drives. The livestock were kept in the interior courtyard where a corral and stockade contained the animals and protected them from outside elements and threats. Following the Mexican War (1846-1848), the United States gained the land on the northern side of the Rio Grande. Around this time, Doña Uribe’s son, Blas María Uribe, married Jesús Treviño’s daughter Juliana. In 1848, Blas María Uribe moved his wife and children to the Treviño-Uribe Rancho to reinforce their claim to the land. Three years later, Uribe added a two-room sandstone building to accommodate his family and a new arched gate with a troneras (gun port). 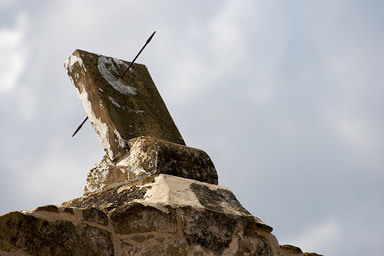 At the top of the arched gate, Uribe placed a stone sun-dial, which visitors can still see today. The construction techniques reflect distinctly Mexican influences Uribe took from Guerrero. The thick walls, continuous enclosure of the complex, and the troneras attest to the still threatening nature of Rio Grande frontier life in 1851. In 1854, the complex expanded again with the addition of a spacious single room at the north end of the 1851 building. In 1871, the construction of a large flat-roofed building completed the Treviño-Uribe Rancho. This building is near the courtyard gate and contains six doors, suggesting that by this time strategic defensive measures were no longer such a concern. Some 40 years after the initial construction of the Treviño-Uribe Rancho, this final building effort still adhered to the building traditions and styles found in Guerrero and throughout the borderlands region. The builder of this last addition, however, included popular local decorative elements that demonstrate the influence of both nations’ practices in a borderland community. Following this last building campaign, Uribe officially platted the town site for San Ygnacio, Texas in 1874. Changes in the area, including relative safety from American Indian and bandit attacks, increased population, and greater prosperity, allowed the town to shift its layout and structure. Uribe’s town plan followed traditional Spanish colonial town planning in utilizing a grid pattern and a central plaza. The town included the Treviño-Uribe Rancho, which sat in a strategic position on a high bank above the Rio Grande. Settlers, most of whom were directly related or married to the Trevino-Uribe family, constructed the handful of other buildings in the community for mutual protection and access to the river. During its period of prosperity, the town operated a ferry across the Rio Grande River to its Mexican counterpart and became the principal crossing point for thousands of head of cattle headed to markets in Mexico. It also moved staple goods such as aspiloncillo (unrefined sugar), flour, beans, and corn into the Texas interior. As the area became safer, and the centralized town came into existence, the community shifted development away from the river toward the new town blocks. The residents also moved their activities from their protected courtyards to the public town plaza. Today, the town still contains more than 30 historic properties, including the Treviño-Uribe Rancho, most of which are listed in the National Register of Historic Places as part of the San Ygnacio National Historic District. Currently, this borderland community has a population of 900 people, most of whom are descendants of the original families that settled the area. The Treviño-Uribe Rancho appears much as it did nearly 140 years ago. Visitors can see for themselves what life was like on a rancho during the historic and influential Spanish/Mexican ranching period in Texas. Guided tours of the site will be available following the River Pierce Foundation’s stabilization and restoration efforts. The current owner, a descendent of Jesús Treviño, is committed to preserving the Treviño-Uribe Rancho, which is exceptionally significant as a rare artifact of Spanish colonial/Mexican settlement efforts in the lower Rio Grande region of South Texas and the northern Mexican state of Tamaulipas that uniquely expresses the bi-national history and culture of that region. Treviño-Uribe Rancho, a National Historic Landmark, is located at the junction of Uribe and Treviño Sts. in San Ygnacio, TX. Click here for the National Historic Landmark file: text and photos. The La Paz County Historical Museum, located at 305 Lincoln St. in Benevides Elementary School, San Ygnacio is open 8:00am to 5:00pm Monday-Friday, September-May and may be reached at 956-765-8312. For more information, visit the River Pierce Foundation website or call 956-765-5784. 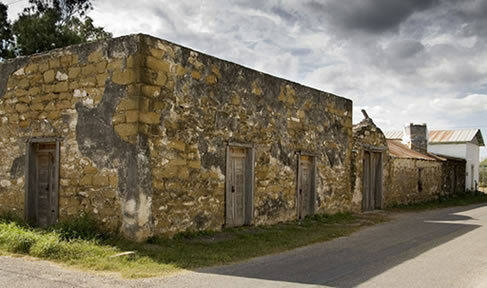 The Treviño-Uribe Rancho has been documented by the National Park Service’s Historic American Buildings Survey.